We believe that every single one of us has an Ian Poulter inside of us, minus the funny pants. We could be smashing through the worst golf courses with ease, but only with the right amount of practice. And the right amount is a lot of it. The golf swing action is so swift that you don’t have the time to think as you move. To make the swing behave to your tunes, you need to practice. If you are trying to go professional, it should take up every spare minute of your day. ​But practising blindly will not get you anywhere. You need to undo the wrong movements and deliberately practice the right swing movement. There’s also the concept of Deliberate practice where you step outside your comfort zone and challenge yourself in practice. Building both these trends into your practice sessions needs you to put in the time. Given the state of traffic and the escalating green fees, we explored how we could practice better and cheaper at home. This is a mat made of synthetic grass that simulates actual grass. It is used for putting indoors. Based on the quality of mats, you may get an exact same experience as the putting turf at the course. Putting greens are available in par-3 forms with inclines and what not. The manufacturers aim at making the experience as authentic as possible. Golf simulators seem like a daunting purchase. And you may doubt their worth after experiencing incompetent ones at the local golf shops. We have explained how the golf simulators work and whether they are really worth it here. Golf simulators start at $400 and go up to $65,000 in the full-fledged models. We can test out the demos at the manufacturers’ shops and make a decision based on that. 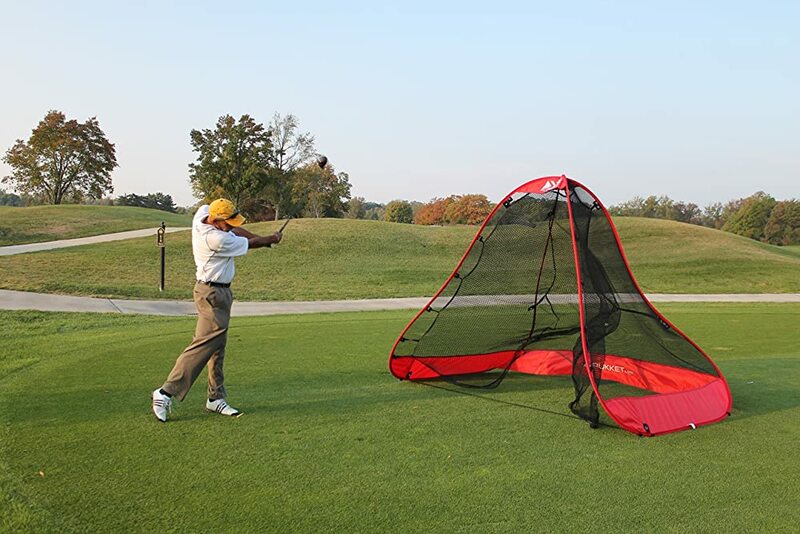 Golf practice nets are the most hassle-free practicing aids in the list. You need some space to set these up. When buying practice nets, pay special attention to their size, the durability of the net, the stability of their position once set up and portability. 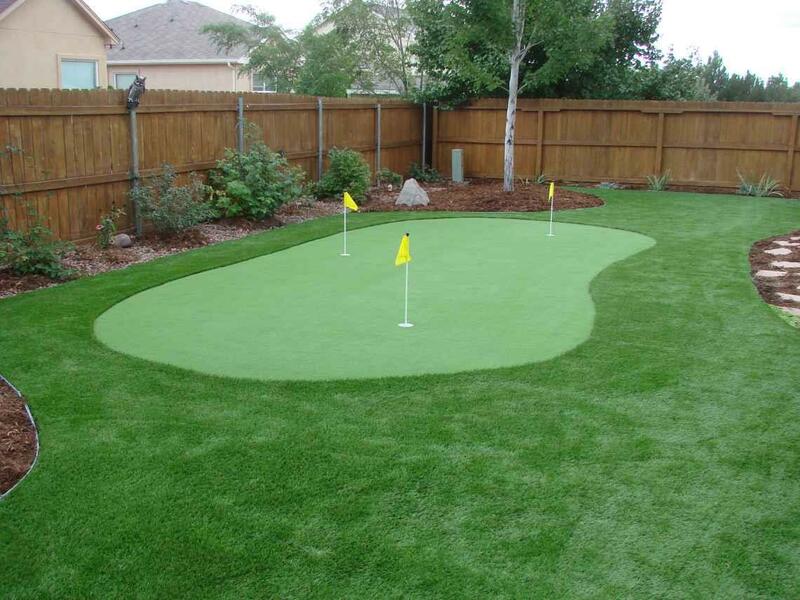 You could have your own putting green in your backyard. This helps you get a more authentic putting experience as the grass is real. 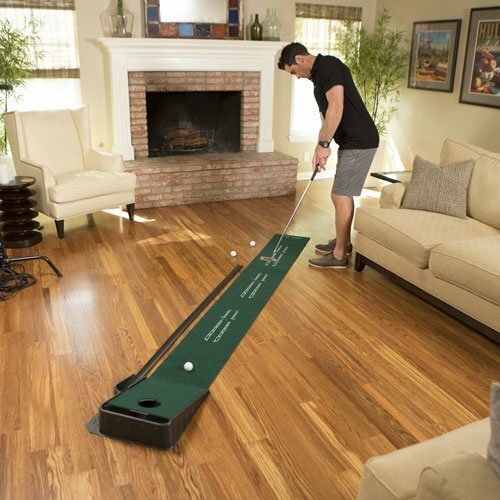 In under 45 hours, you can build your personal putting green. You need the right kind of grass seeds and items like plastic roller, drainage tiles, fertilizer, fungicide, mower etc.. This is the same equipment used in maintaining your lawn. We have done a feature on how to build a putting green in your backyard. Practice does not make a man perfect. A targeted practice plan aimed at deliberately improving the game is what will make your perfect. You need to do double the practice first to undo the incorrect swing and movements that you have already practiced. And you also have to learn the new swing. You can teach an old dog a new trick. Deliberate practice of the new tricks over old shortcuts is the key. And practising at home also has a great advantage. At the course, you might fumble at some shots you find difficult. For some people the pet peeve is chipping, for some, it’s putting. Practising and failing at these shots until you succeed is a common trend. Doing this in front of an audience can be daunting. So you can practice the correct swing mechanics at home before trying them out at the course. This way you can gain confidence in your moves before you try it out amidst other golfers. A Putting Mat is a stretch of synthetic grass measuring around 6-15 feet. This looks and feels just like the putting green on the golf course. It has one or multiple holes or cup holders where you can route the ball to. 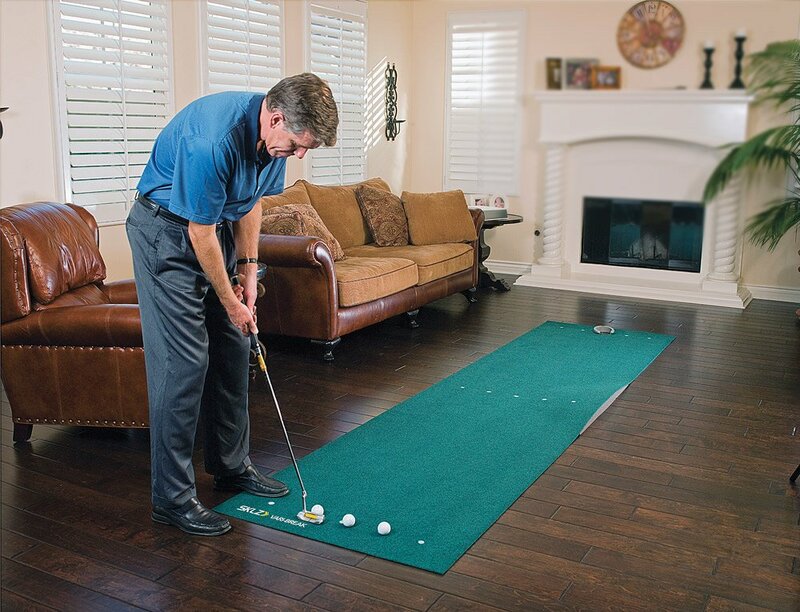 A full-size putting mat can be set up in your hall or outside in the garage or your driveway. 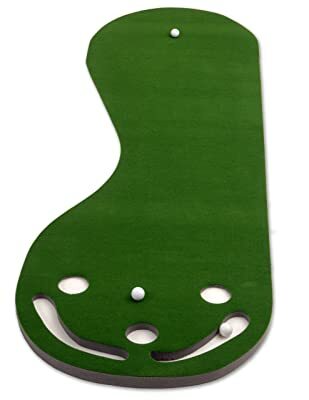 Usually, the putting mats are flat and they adapt to the shape of the ground they are laid on. Putting requires the most amount of practice. Even experienced professional golfers are often nervous putters. These putting greens can bring down your 5 putting record down to 2 or 3 based on the practice. And specifically off-season, your putting charm will quickly deteriorate over the winter. 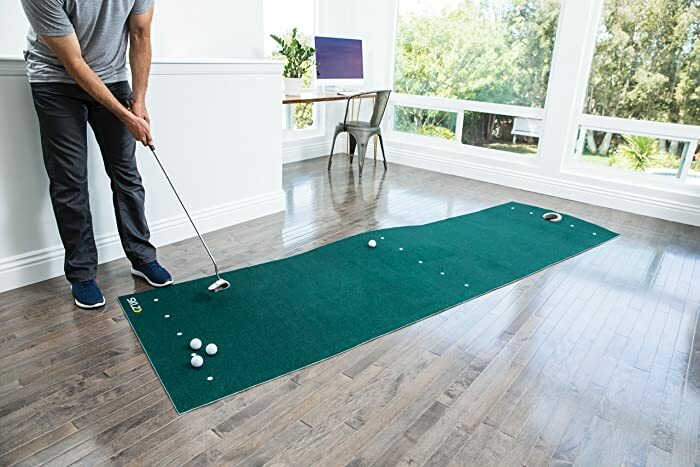 Indoor putting mats offer you a chance to stay ahead of the weather. You don’t have to pick up all the golf balls yourself either. It’ll be a fun assignment for the kids. - Putting mats with foam inserts are available. You can move the foam around to create undulation on the greens as required. - Putting mats with uphill holes are available. This very challenging format will teach you to control your putting better especially for the difficult courses and greens like Augusta National. - Then there are putting mats which show the tracks of the golf ball when putt. This gives you real-time mapping of your path and makes room for improvement. These are downright cheap to affordable at $20-400. Putting practice at as less at $50 is a great deal. Golf practice nets are much like the practice nets of the other games. But these are specialized to capture the golf ball at their momentum. The main advantage of these practice nets is that you can try any golf club with them. Woods, drivers, hybrids, irons, you can practice with them all. And more importantly, you don’t have to go hunting off for the balls. They will lie inside the practice nets to be collected together. You also have chipping nets with target for practice. Chipping is a monster task for many beginners. Getting the jitters off off-course can be really re-assuring. 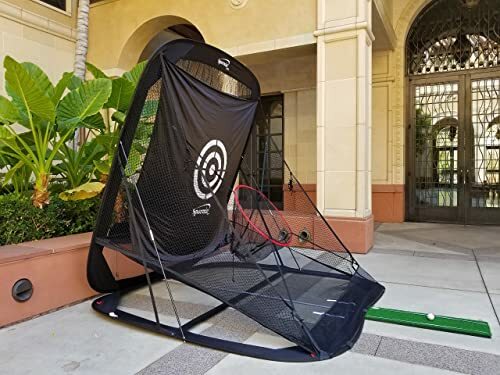 Golf practice nets can be set up inside the house or the garage or even in the lawn. - The portability of golf practice nets like Rukknet adds to their convenience. When the outdoors are sunny, you can layout the net in the lawn. When the sun sets or in the case of rains, use the practice nets inside. These nets are strung on fiberglass or metal frames which can be easily collapsed. Using the practice nets at home can drastically cut the cost of your practice. 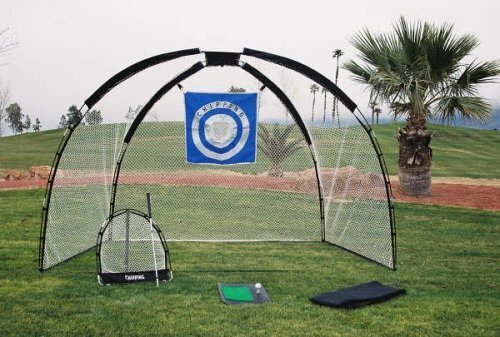 Figuring in the practice range/ green fees, travel costs and the patience-draining traffic, you will save up quite a bit with the practice nets. You will also be able to practice when you are energized. Golf simulators are the large screens you see in the popular golf videos. These are fully electro-mechanical systems with sensors that simulate the movement of the golf ball based on the impact of the ball. Usual simulators involve few cameras, sensors, and radar which create a visual model of the shots. The modern simulators can even create elevation changes and take them into account while mapping your shots. The sims only take the physical data of the force with which the ball was hit and the direction it was hit in and create the shot based on predictive analysis. And you end up seeing the flight trajectory on the screen in 2D almost as if from the vantage point of a real-time golfer. ​Golf simulators are accurate if you do the right kind of research before buying one. The sims in the golf shops might not be accurate because word is, they are boosted to make the buyer feel good and buy more merchandise. But with customer reviews, you get a real picture of performance. Golf sim is a system of multiple machines and each machine has its own small margin of error. This adds up and causes some inaccuracy in the final distances. But that’s the cost for a whole lot of convenience. Golf sims are versatile. You can practice all kinds of clubs and moves on these. You may have the options to select from a visual model of many famous real golf courses. Golf sims also include factors like wind speed and allow you to select between various weather conditions for playing. The accurate golf sims are expensive. The more data they collect, the more accurate their representation of the game is. And data gathering capacity is going to cost you. Golf sims are convenient because they allow you to practice at home in near natural conditions of the golf course you select. Putting is critical to your golf game. But it can also be fun for family and friends. All you need is a backyard putting green to make it so. We have detailed the process of creating a backyard putting green here. In less than 45 hours, you can lay the foundation for it and sow the grass in a sunny part of your backyard or lawn. You will have to tend to the grass every day. This putting green is more of an everyday commitment than a hobby. So opt for it only if you have the time for it. 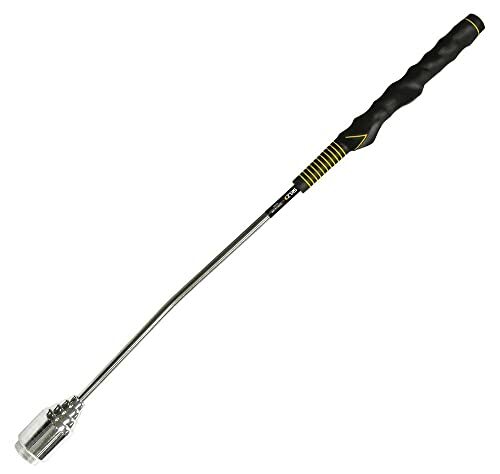 It gives you the natural putting experience at home. You don’t have to go to the practice range and feel other golfers’ seething impatience on your neck. 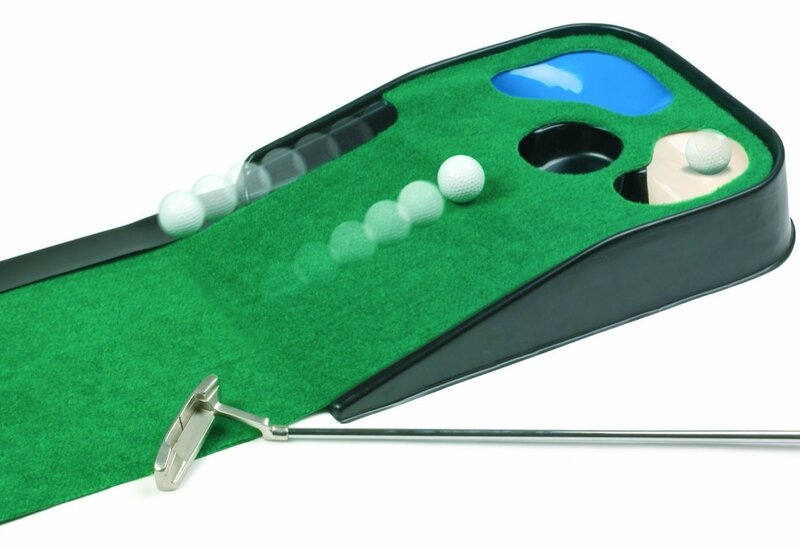 It is fun for the family and friends in a little putt-putt game. You may even generate enough interest in your kids to take up the game. It can be done on a moderate budget depending on what supplies you already have at home. Golf practice does not mean you need to practice by hitting a ball with a golf club. There are a number of props used to practice the right swing before you head off to an actual course. You don’t need to be looking out for green pastures when you practice golf. You can do it in the comfort of home with your kids, siblings or parents cheering you on. Practice will be far less painful if you don’t have to wade through traffic and multitudes of golfers, wannabe and otherwise. You are not to worry when there are neat tricks to allow you to practice at home. Golf simulators, practice nets, putting mats, backyard putting greens are all convenient solutions.